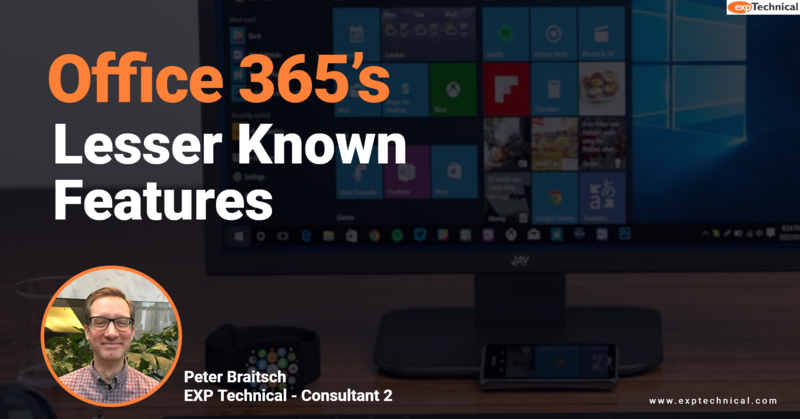 Some of Office 365’s features are well known: email in the cloud, always up-to-date Office suite software, anti-spam and anti-phishing filters, and OneDrive storage to name a few of the most popular. But who will sing the praises of its lesser-known features? I will! Below is a brief overview of some underappreciated gems that can make your life easier. Outlook does all sorts of great things for us. It’s our email app, first and foremost, but it also manages our calendars, contacts, tasks, and notes. And with the addition of some free add-ins from Outlook AppSource in the Microsoft Store, it can do all those things even better. Want to grab an Uber to that meeting you just booked? Use the Uber add-in for Outlook and hail a ride with a single tap on your phone. It can even pre-load the pickup and destination locations. Smartsheet fanatic? Me too! Get the Smartsheet add-in for Outlook to send anything from your Inbox directly to a new or existing Smartsheet. Try FindTime for your next meeting. It polls invitees about the best possible dates or times and then auto-schedules the meeting once there’s a consensus. Make efficiency apps even more efficient by integrating your Trello, Wrike, Evernote, or Wunderlist account with Outlook for Office 365. And that’s just the beginning. Check out AppSource for hundreds of other free add-ins. There’s much more to Office 365 than Outlook, Word, and Excel. Below are a few Office 365 supporting apps worth checking out. • Delve can provide a window into all Office 365 activity at your company including recently edited documents, your co-workers’ profile updates, the most popular documents at your company, and more. • Teams is a newer addition to Office 365 that integrates Skype-like chat and video conferencing complete with document and screen sharing functionality. This allows you to create your own teams whether you’re collaborating on a single project or rallying a whole business unit. • Planner is a Trello-like task manager for individuals or teams. It lets you move tasks around among team members and build in approvals or other workflows. • Flow is a clever automation tool. It creates rules with automatic triggers to do things like automatically save your email attachments to your OneDrive or create tasks in Outlook whenever your boss emails you with a certain keyword in the subject line. • Office Lens is an iPhone app that lets you take a photo of a page or a whiteboard and turn it into a document you can edit. You can also save it directly to your OneDrive for later use. This is just a brief sampling of the apps and add-ins that can help you get the most from your Office 365 subscription. Dig even deeper and you’re bound to find many more. Happy hunting.